If convicted and given a jail sentence, home for Jay Y. Lee, the billionaire de facto head of South Korean conglomerate Samsung, could be a crowded prison set in wooded hills just to the north of Seoul, where disgraced politicians and business leaders have previously served time. Lee, who has been tried on charges ranging from bribery to perjury in a scandal that triggered the dismissal from office of the country's ex-president Park Geun-hye, will hear the verdict of a lower court on Friday. Prosecutors are seeking a 12-year jail term. 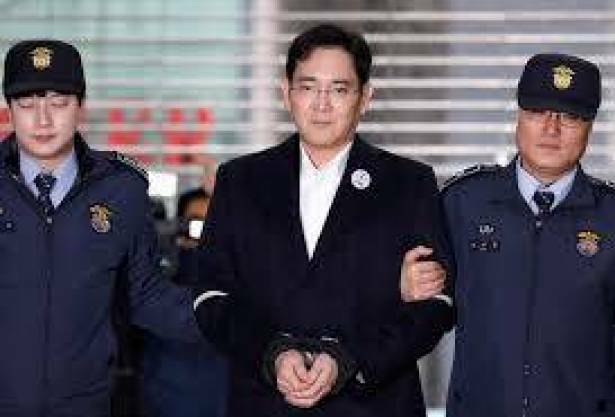 The 49-year-old Samsung scion denies wrongdoing, and would almost certainly appeal any conviction, with his case likely to be fast-tracked to the Supreme Court for a final ruling, probably next year. In the event, then, of an upheld conviction, Lee would likely follow a route to Uijeongbu Prison taken previously by a former prime minister and the heads of the SK and Daesang conglomerates, among others. If sent to Uijeongbu, Lee would likely be held in a single cell, equipped with a TV, shelving, coat rack and electric fan. Prisoners are expected to work - tending the flower garden is seen as a popular choice, said a prison official, who didn't want to be named as he is not authorized to speak to the media - and he would be allowed to exercise outdoors for an hour a day. They can also take up study courses in English or Japanese, and attend religious services. Chey Tae-won, the convicted SK chairman, dedicated a book he published while at the prison "to the Lord". Lawyers said white-collar crime inmates often reduce their manual work time by having "special meetings" with visitors, which can be granted at the discretion of the prison warden. Directing operations at Samsung Electronics, the world's leading smartphone and memory chip maker, from prison, though, would be a challenge as most visits are restricted. Previous conglomerate, or chaebol, heads relied on leadership committees to mind the shop while they served their sentences. For now, pending this week's lower court verdict, Lee remains in the Seoul Detention Centre where, since February, home has been a 6.56 square meter (71 square foot) cell, with a partitioned toilet. Meals are simple, normally rice and side-dishes, and cheap, costing 1,443 won ($1.26). The center, in a Seoul suburb near apartments built by Samsung C&T (028260.KS) and stores advertising Samsung Electronics' (005930.KS) smartphones, is the country's third-most crowded correctional facility. A justice ministry official told Reuters that Lee could ask to be transferred - possibly to the newer 12-floor Seoul Eastern Detention Centre, which local media say has basketball courts, elevators and wall-mounted flat-screen TVs. A former top aide to ex-president Park, on trial for corruption, recently moved to the new Seoul facility. While preparing the lengthy appeal process, previous high-profile inmates have hired so-called 'butler lawyers', who stay with detained clients for hours a day to get them out of their cells and into the more comfortable visitors' rooms. Justice ministry data show SK chairman Chey had more than 1,600 meetings with his lawyers during his 17-month detention in 2013-14 - more than three meetings every day.